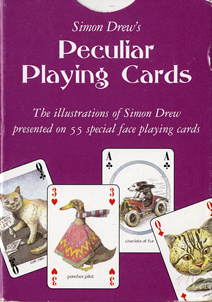 The Simon Drew game set is devised and drawn by Simon. 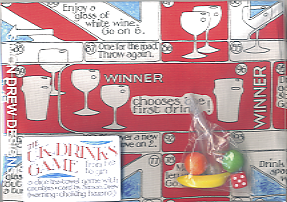 The game is printed onto a cotton teatowel, placed in a box along with a greetings card. The ‘UK Drinking Game’ with detailed illustrations by Simon Drew. 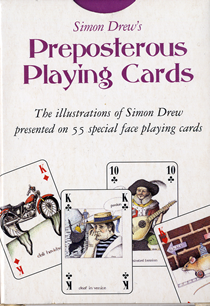 There are two sets of playing cards designed by Simon Drew. 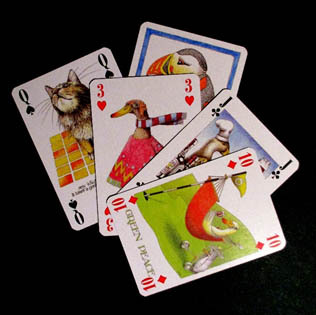 Each is a standard 52-card deck + 2 jokers – but with a twist. The face of each card bears an illustration by Simon. There are 54 different illustrations per pack.They otherwise conform to all the usual rules of card packs, with all cards in every suit accurately represented. 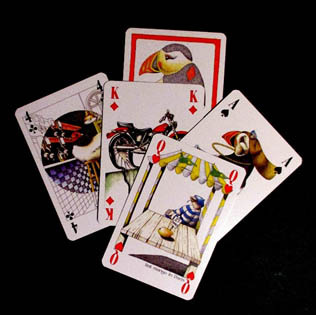 The pack of ‘Preposterous Playing Cards’ has a red-bordered puffin design on each back, whilst on the back of the pack of ‘Peculiar Playing Cards’ the puffin design is blue-bordered, so that you can play a game of bridge using the two packs together.